The CircuitWorks range of PCB rework, repair and prototyping materials, recently launched by main UK distributor Intertronics, come in very convenient and easy to use formats and are now readily available ex-stock. 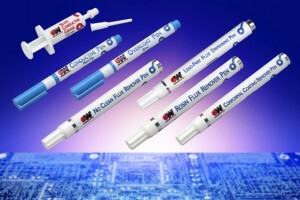 The easy-to-use valved pen and syringe delivery systems enable developers, technicians, installers and servicing engineers to carry out small area electronics repair. This includes cleaning, protection, bonding and replacement of conductive tracks to circuit boards and components. They are well suited to the production environment on the workbench or for rework on site as part of a technician’s mobile toolkit. 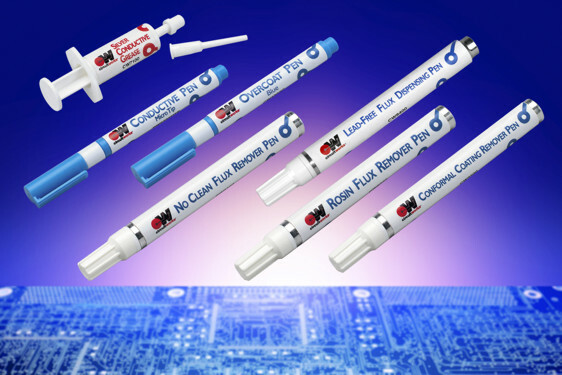 In particular, nickel and silver trace pens facilitate drawing of highly conductive traces, jumpers and shielding. Clear or green solder protective overcoat is available, as is no-clean, rosin and lead-free flux. Thermally conductive heat sink greases (including a silicone-free version) and various cleaning products complete the set. All CircuitWorks products are compliant with IPC-7711 Rework of Electronic Assemblies, and ANSI/J-STD-001. For further information please see www.intertronics.co.uk/circuitworks or visit their blog at www.adhere.uk.com – also see www.youtube.com/intertronicsadhere.